As longtime readers know, as the publisher, I generally don’t write posts rebutting what other bloggers on OC Political write (and there’s no pre-approval process for our writers), as each writer’s opinion is their own, but last night’s blog post accusing Supervisorial Candidate Don Wagner of not being pro-life based on his record in the State Assembly is beyond the pale. During his Assembly tenure, Wagner had a 100% on the legislative scorecards of both the California Pro-Life Council and the Life Priority Network, scoring identically to then-Assemblywoman/now-Senate Republican Leader Shannon Grove (R-Bakersfield) and to the right of even then-Assemblyman Travis Allen (R-Huntington Beach), for example. I’m going to quote last night’s blog post and then note the reality below it. Wagner so vigorously fought AB 775 (Chiu and Burke, 2015) that the National Abortion Rights Action League (NARAL) of California took a clip of Wagner in committee and put it on YouTube under the title “Autumn Burke responds to anti-choice legislator at AB 775 hearing” and there was an article in the national liberal web site Jezebel that referred to him as “anti-abortion California Assembly member Donald P. Wagner” and quotes the video. Wagner fought vigorously against AB 154 (Atkins, 2013) as well, such that NARAL California again took a clip of Wagner in committee and put it on YouTube, this time under the title “California Legislator Wants to Know Where the Underserved Women Are” and there was an article in MSNBC that attacked Wagner for his fight against this bill. Wagner voted against AB 980 (Pan, 2013) FOUR times in the Assembly. On another note, last night’s blog post stated, “No one seems concerned or bothered by the fact that he vacates the seat he just ran for and will leave his city in a special election lurch, but yay for fiscal responsibility.” Well, that’s not the case: Irvine City ordinances specifically say that the Mayor Pro Tem becomes Mayor if the latter seat is vacated (and then the City Council appoints a person to fill the subsequent vacancy on the Council). Finally, the premise of last night’s blog post was that the writer received “a forwarded email yesterday from someone who called herself, Dr. Something-or-other, Ph.D.” who provided a “representation that [Wagner] is the only ‘Pro Life’ Third District candidate is not only untrue, because there are two other ‘Pro Life’ Republicans in the race…” It is rather unseemly to launch an attack on a candidate based on receiving a forwarded email originally penned by some random emailer. I’m a resident of the Third District, and I’ve not seen a single mailer, social media posting, article, or press release from Wagner (nor from any independent expenditure) claiming that Wagner is the only pro-life candidate. Indeed, until last night’s blog post, I had not seen a single mention of abortion from any candidate literature or independent expenditure, nor was there any mention of abortion at the Third District candidate forum. On Tuesday, Retired Business Owner Joe Kalmick (D) defeated Small Businessman Peter Amundson (R) in the run-off election for the District 1 Council seat with nearly 65% of the vote. The Seal Beach City Charter requires a January run-off when no candidate receives more than 50% of the vote in the prior November election. In the four-candidate race in November, Kalmick won 41% of the vote while Amundson won 28%. Eight years ago, Kalmick lost the District 1 run-off election to Planning Commissioner Ellery Deaton (R). Now terming out from the City Council, Deaton endorsed Amundson to succeed her. Kalmick’s election breaks the Republican majority on the Seal Beach City Council, though it does not deliver a Democratic majority. The Council goes from 3 Republicans, 1 Democrat, and 1 No Party Preference to 2 Republicans, 2 Democrats, and 1 No Party Preference. Republicans have a 7% registration advantage in Seal Beach District 1. The Registrar of Voters began sending out ballots for this election on New Year’s Eve, so ballots started arriving in voters’ mailboxes on January 2. Ballots can arrive as late as tomorrow and still be counted, but it is impossible that enough ballots would arrive to overturn Kalmick’s landslide lead. Orange County Register reporter Susan Golding strangely wrote, “the runoff drew big drama and controversy,” simply because a PAC sent a mere two mailers attacking Kalmick. Weirdly, Golding referred to the PAC as the “California Taxpayer Protection Committee, a conservative fund-raising organization based in Northern California.” This is an odd description for them, considering the California Taxpayer Protection Committee’s largest donor in 2018 was the Orange County Employees Association, the county’s largest labor union. 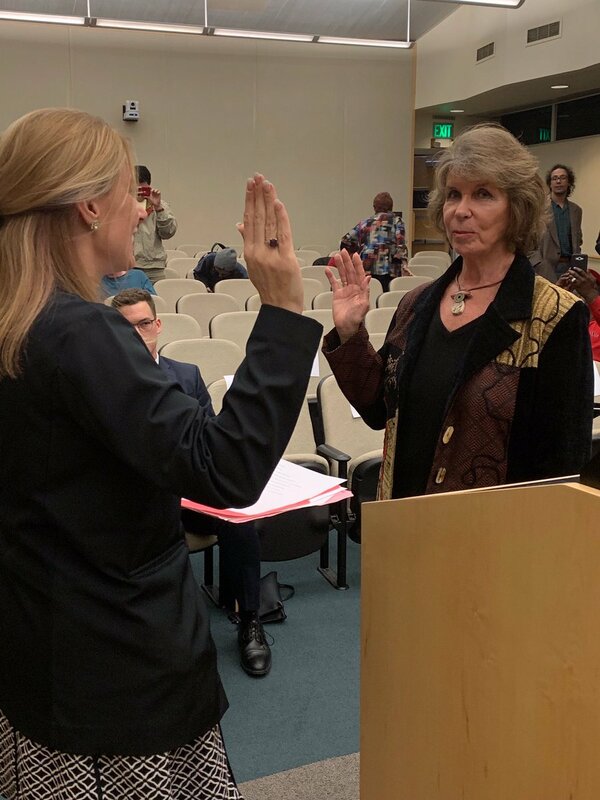 On a 3-1 vote, 74-year-old former Councilwoman Jan Flory (D) was appointed to fill the Fullerton City Council vacancy that resulted when at-large Councilman Jesus Silva (D) won the District 3 Council seat, defeating at-large Councilman Greg Sebourn (R). The at-large seat will cease to exist after the 2020 general election. First elected during the 1994 Fullerton Council recall, Flory served on the Council from 1994-2002 and again from 2012-2016. Flory was appointed with the votes of Mayor Jesus Silva (D), Mayor Pro Tem Jennifer Fitzgerald (R), and Councilman Ahmad Zahra (D). Councilman Bruce Whitaker (R) dissented. With Flory’s appointment, the Fullerton City Council now has 3 Democrats (Silva, Flory, and Zahra) and 2 Republicans (Fitzgerald and Whitaker).